Hello. My name is Melissa and I’m a Chocoholic. And a Peanut Butteraholic. (Is that a thing? Because if not I need to make it a thing because the craving is REAL!) 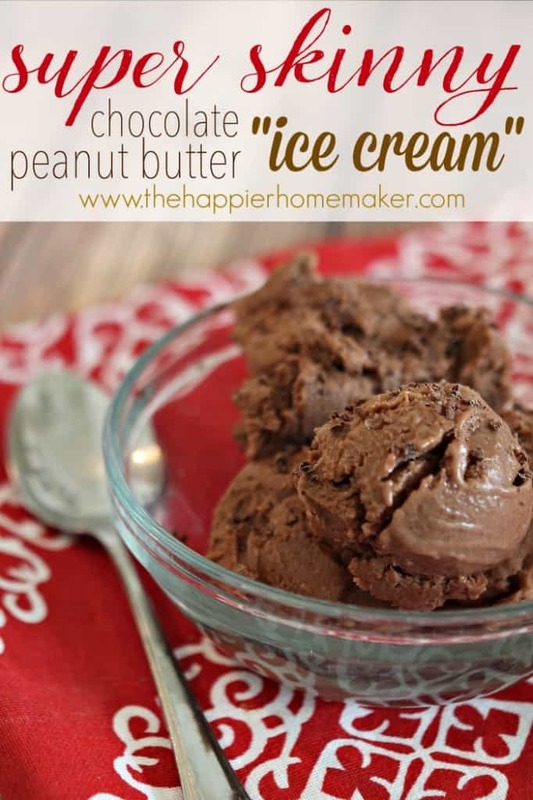 Luckily for me, I have this Skinny Ice Cream recipe, and it’s 0 Weight Watchers Smart Points, woo-hoo! I am the first to admit that I have a HUGE sweet tooth, as you can tell from perusing my recipe gallery!! But lately, I’ve been hunting and digging for any way to satisfy my sweet cravings without blowing my commitment to my fitness goals (think Spartan Race this summer-yeah, I have a ways to go with training…but I digress.) I always keep sliced bananas in my freezer for my smoothies and whipped up this faux chocolate peanut butter ice cream a few weeks ago and LOVED it! It was perfect. 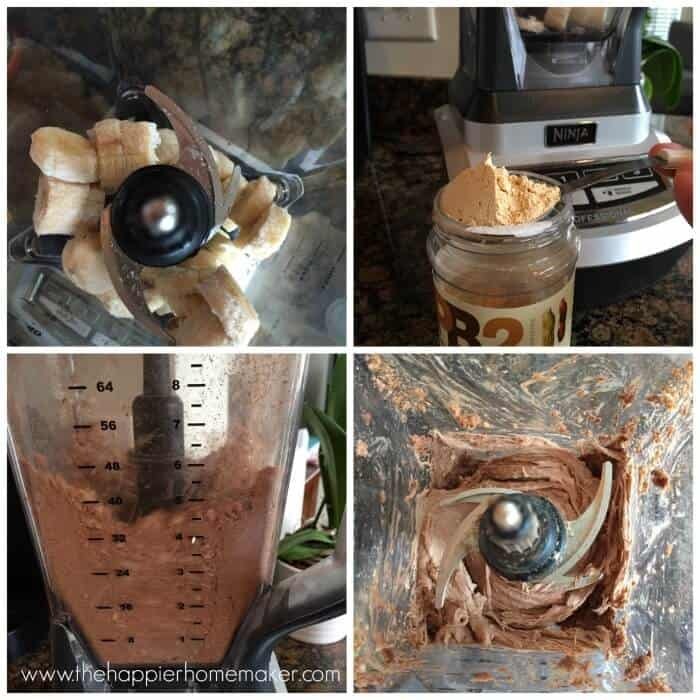 Now, if you don’t like bananas this isn’t for you, there’s definitely a bit of banana flavor in there, but the texture is just like ice cream and the combination of the chocolate and peanut butter flavors are the perfect craving-squasher! Brace yourself-the directions are complicated….throw everything in a food processor or blender and blend until uniform and smooth. Whew! That was rough right? If you eat it right away it has more of a soft-serve texture but if you’d like a thicker ice cream texture just throw it in the freezer for an hour then scoop out with an ice cream scoop. For a little extra grate some dark chocolate over the top! **Edited to add per reader questions: I eat a scoop or two at a time so I estimate this recipe makes 4 snack sized servings at 87 calories each. 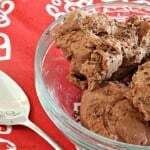 I make a batch and keep it in a plastic container in the freezer for those late night chocolate cravings-just a scoop usually satisfies me and it’s awesome to not have the guilt and get a dose of protein in the process as well! Anybody else out there love chocolate and peanut butter as much as I do? How do you satisfy your cravings? 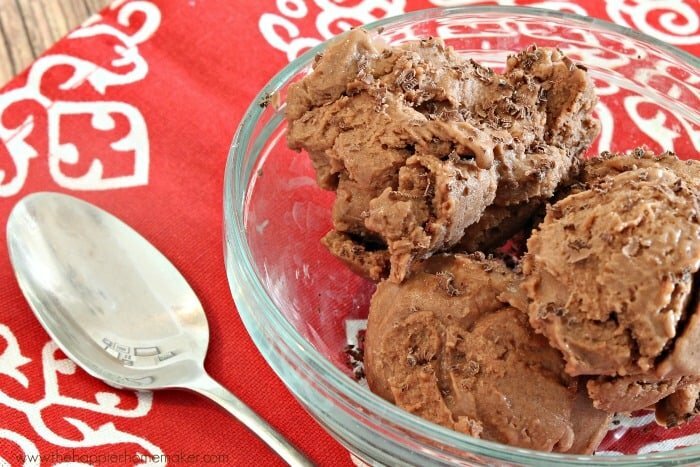 Indulge your sweet tooth while keeping healthy with this guilt free “nice cream” recipe. No sugar, no dairy, 0 Weight Watchers Smart points per serving! Wondering how this would work if I added a partial scoop of protein powder to boost the protein?? I’ve seen in many other “nice” cream recipes that it does, in fact, work well. Oh man, I am making this today! Looks so good! This for one or more portions? Where do you get the peanut butter powder? Target also carries it or Amazon. I’ve been finding it at most stores lately-thank goodness! I can’t believe this only has 4 ingredients! I would love to make this!! PINNING! Can you tell me what containers it would be for 21 day fix? I’m sorry Jaime I am not familiar with 21 Day Fix so I’m not much help there! Would an equivalent amount of natural unsweetened peanut butter substitute for the powder?